Bonjour and a warm welcome to the FlashPunk Tutorial 03! Here I’m going to show how to implement some camera movement. It’s a short one, so you shouldn’t have to spend too much time on it. It’s the logical continuation of the previous tutorial. 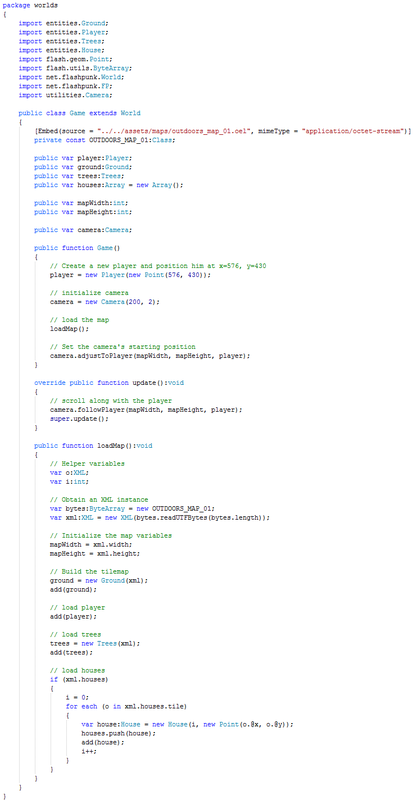 As always, you can get the source code for the previous tutorial here, and the final code of this tutorial here. Without further ado, let’s just get started, shall we? So as you remember, we created a map of dimensions 1248×768 pixels, while our flash player window was just 624×480. Clearly, there’s area in the map that we haven’t seen in the game, because the camera won’t move along. Our avatar is free to roam outside the screen boundaries, but we’d like to follow him right? scrolling. We are just going to do very basic stuff – we’re going to move the camera in the direction in which the player moves, if the player moves close enough towards one of the 4 screen boundaries. We added 2 new variables to the Game world. The first two are map related, they store the width and height of our map. The next 2 are camera related. cameraOffset contains the pixel distance (or padding, if you will) from the screen edge that is the closest the avatar must be able to get to the screen edge. Only if the camera is already on the map’s boundaries can the avatar move withing the offset without the camera moving along. I hope this makes some sense. 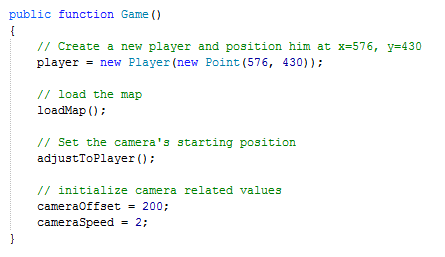 The other variable is the camera speed, which is the speed the camera is to follow the player. It is logically related to the player’s movement speed. For example, if the camera’s speed is lower than the player’s movement speed, then it means the player can outrun the camera, but if the player’s movement speed was lower, then the camera could potentially lose focus of the player by going too far (not with the offset though). 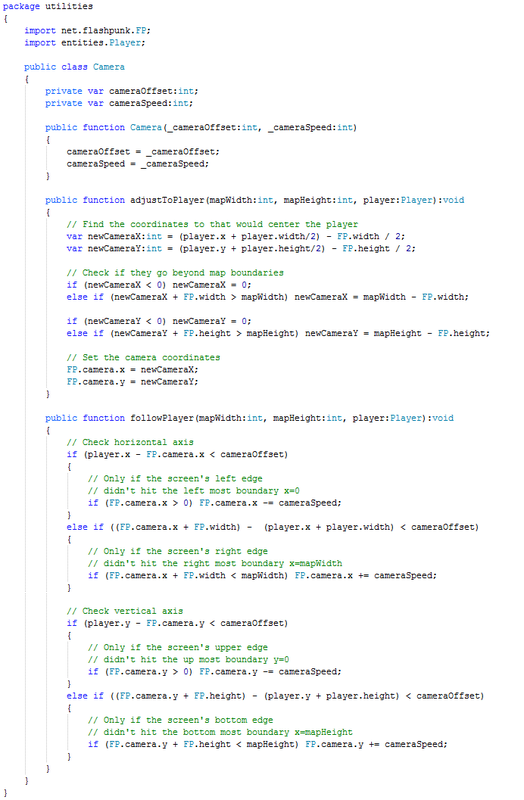 Anyways, in the constructor class we’re initializing the cameraOffset to be 200 pixels, and the cameraSpeed to 2 pixels, which, as you’ll remember, is the speed of the player. Next are some changes in the loadMap() function. When we get the xml instance of the map, we read the values of the width and height tags and store them in the mapWidth and mapHeight variables respectively. the left screen boundary, we take the player’s x coordinate (which is actually the coordinate of the player sprite’s left edge) and the camera’s (the part of the screen that we can view through the flash player window) x coordinte. We substract it from the player’s x coordinate and we get the distance between the player left edge and the screen’s left edge. If this distance is less than the cameraOffset, we need to move the camera (FP.camera.x) horizontally by 2 pixels (cameraSpeed). But before we can do that, we need to check if the camera already reached it’s most left position, in other words, we need to see if the camera already hit the map’s left boundary, which is 0. If that isn’t the case, we can go ahead and decrease the camera’s x coordinate. We do the same thing for the other direction, but this time we need to add the width of the screen’s view portion and the player’s sprite (actually the hitbox). We again also need to check whether the camera hit the map’s boundary. Try the demo now, enjoy as your avatar roams the forgotten lands :D. But wait, what happens if we place our avatar to a position that on the other side of the map? Try it, by changing the values of the player’s position from 10,10 to something like 900,500. Hmm… the camera seems to start at 0,0 no matter what, and then it only slowly (namely by the speed you set – 2 pixels per frame) moves towards the player. This is an issue, and it must be addressed. We simply need a new function that we can call after loadMap() that sets the FP.camera’s starting position by evaluating the player’s position. It should again first check on the horizontal axis, then on the vertical axis. In most cases, it should position the camera so that the player ends up in the center area of the screen’s view port. So for the x axis for example, we’d like something like FP.camera.x = (player.x + player.width/2) – FP.width / 2, and the same idea goes for the y axis. 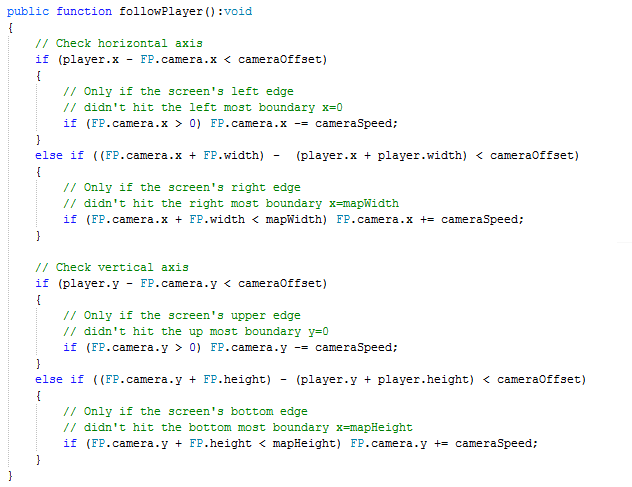 Now of course, there’s the issue with the screen boundaries, so we’ll need to check the new FP.camera.x and FP.camera.y values if they exceed the map boundaries. This is done by some simple if conditionals, nothing very fancy there. Aaand we’re done. You can get the entire code here. See you soon with a bigger tutorial next time on transitioning between maps, and creating a world map to show the current position of the player. ← Random Rant: I want reputable journalism! Thank you so much for making these tutorials. They are the most complete and helpful I have found so far. col: 14 Error: A conflict exists with inherited definition net.flashpunk:World.camera in namespace public. Very easy to fix, in the World.as, you need to change the camera by something else, like lcamera or camera2. That if you want to do this tutorial. would be nice to see an updated version with a new camera system.